The information age has seen the development of increasingly complex electronic pathways, networks and devices that carry vast amounts of valuable data. This information is now the target of sophisticated and malicious individuals and organizations intent on breaching confidentiality, disrupting service, and outright theft. There is strong evidence that cybercrime; phishing attacks, computer fraud, theft of information and money, is on the increase and that many organizations are under constant threat. These cyber attacks have the potential to destroy customer confidence, and undermine successful enterprises. The most recent CSI Computer Crime and Security Survey found that the average cost per security incident was $235,000, and the largest loss reported was some $6 million. Financial fraud continues to consistently be a highly expensive attack, averaging almost $450,000 in losses per organization that suffered fraud. Other security surveys report even greater financial losses, and an increasing incidence of all types of malware. For example, security experts at McAfee Labs catalogued more than 16 million individual pieces of malware in 2017. This works out to be around 40,000 pieces per day, meaning the need to remain protected and vigilant is essential. As a result of these on-going threats, there is a strong demand for the means to secure vital electronic pathways, and to offer both providers and users a high level of confidence in systems integrity. However, the security structures required to protect data are generally very difficult to design and implement. Even when available, they tend to require considerable understanding of the underlying technical principles in order to be used effectively. This has lead to a proliferation of second-rate products that offer only the illusion of security. So, where does a software developer look to solve these problems? 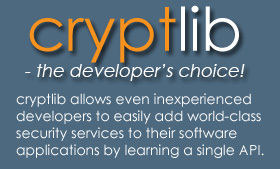 cryptlib provides the tools for developers to meet these challenges. They can approach their security projects with confidence, knowing that they are deploying expert-designed, robust and time-tested security solutions.